OVERVIEW: Sony Pictures Home Entertainment invites you to witness the birth of a fashion icon in the critically acclaimed COCO BEFORE CHANEL, arriving in high style February 16 on Blu-ray and DVD. Beloved French film star Audrey Tautou (The Da Vinci Code, Amelie) stars as Coco Chanel in the unforgettable true story of a young woman who overcame her impoverished childhood and defied societal convention to become the most famous fashion designer of the twentieth century. Written and directed by celebrated filmmaker Anne Fontaine (The Girl From Monaco, In His Hands) and featuring an internationally renowned cast, including Benoît Poelvoorde (In His Hands) and Alessandro Nivola (Junebug), COCO BEFORE CHANEL arrives on Blu-ray and DVD with stunning picture and sound and the latest in fashionable bonus features! 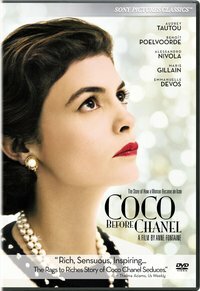 SYNOPSIS: Audrey Tautou shines in this intriguing portrait of the early life of Gabrielle Bonheur Chanel, the orphan who would build a fashion empire and be known universally by her nickname, Coco. She journeys from a mundane seamstress job to boisterous cabarets to the opulent French countryside, possessing little more than her unwavering determination, unique style and visionary talent. Also starring Benoît Poelvoorde and Alessandro Nivola. Featuring lush settings and stunning costume design, Coco Before Chanel is the gripping and dramatic story of an icon who defied convention and defined the modern woman. REVIEW: A woman with an interesting past, hard to understand, yet possessing a remarkable determination was the inspiration for Anne Fontaine, writer and director of the film Coco Before Channel. After reading the book Lilou Marquand Fontaine became intrigued by the life of Gabrielle Bonheur Chanel also known as Coco Chanel, therefore bringing her story to the big screen survived an unforgettable challenge. Audrey Tautou (The Davinci Code) brings the character, style, and vision of Chanel to life in this remarkable performance. The film reflects the sad childhood of Chanel as an orphan girl waiting for her widow father to one day come and visit her. In order to survive the pain of this loss and abandonment, young Chanel focuses on her sewing, a skill that would take her to the big runways of Paris and around the world. Tautou was able to portrait how Chanel develops her signature style with the French countryside as her background and her frustration with love. Overall, the film meets the purpose it was set to accomplish an informative entertainment. DVD: The film is presented in widescreen with a 2.35:1 aspect ration preserving its theatrical format. Looks clean images without any types of color saturation. Sony Pictures Home Entertainment has done it again with this transfer. Not only the picture looks good in this version of the film, also the sound it is good. A Dolby Digital French 5.1 providing a nice complement to the picture. The main problem for some people will be the absent of English audio. it also includes English subtitles. In terms of Special Features the DVD includes plenty of material worth watching. specially for its biographical content. It includes “Coco Before Chanel: La Rencontre ("The Meeting"),” an intimate look at the process of bringing the story of Coco Chanel to the screen, featuring interviews with director Anne Fontaine and star Audrey Tautou. 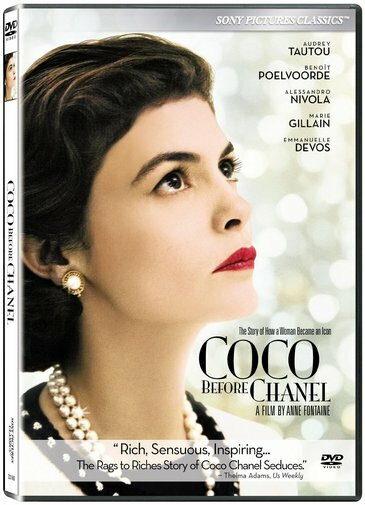 Also included on the DVD is the comprehensive seven-part documentary “The Making of Coco Before Chanel,” spotlighting such aspects of the film’s production as casting, costuming and achieving the film’s sumptuous period look. Additional bonus features include a feature length commentary with writer/director Anne Fontaine and the “Walking the Red Carpet” featurette, in which the cast and crew display their unique red carpet styles at the film’s lavish New York and Los Angeles premieres. “The Making of Coco Before Chanel” Seven-Part Documentary focusing on aspects of the film’s production including casting, costuming and era.